To the befuddlement of Euro critics, Russian inspectors have arrived in the UK to oversee a mass NATO training exercise taking place in Scotland. Despite current tensions between the West and Russia, the team from the Russian National Nuclear Threat Reduction Center is permitted to visit the country to observe military activities as part of a reciprocal agreement contained in the 2011 version of the Vienna Document. The inspectors started their four-day visit on Monday after arriving at RAF Lossiemouth in Scotland. Exercise Joint Warrior involves more than 50 ships, 70 aircraft and 13,000 military personnel from 14 NATO member states and is being held off the north coast of Scotland. A number of critics took to social media to express their concerns over Russia’s freedom to inspect a NATO exercise, with some citing the situation as evidence of diminished UK sovereignty. The clause in question is regularly exercised by the UK, which inspected Russian activities as recently as 2010, as well as other nations party to the agreements contained under the agreement. Nations may be inspected up to three times a year and are required to declare unusual military activities. The host nation is free to contest an application by a nation intent on carrying out an inspection if there are extenuating circumstances. Far from being a strictly European measure, the agreement was developed under the auspices of the Organization for Security and Co-operation in Europe’s (OSCE), and is intercontinental in scope. Signatories include the United States, Canada, Mongolia and Kyrgyzstan. 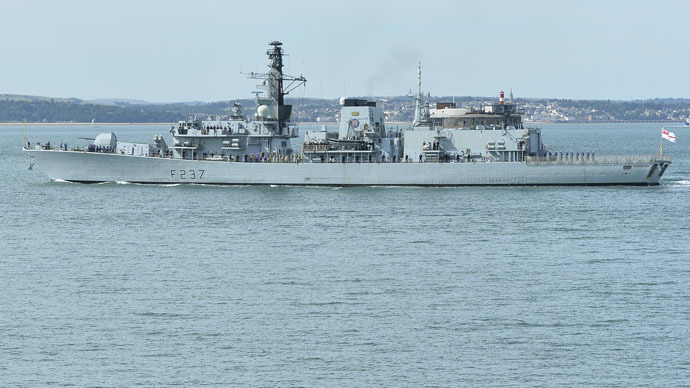 As the visit got underway, it was reported that three Russian warships were being monitored by the Royal Navy as they passed through the English Channel en route from the Mediterranean to the Atlantic.